Aalto EMBA and AaltoJOKO® participant Rami Hakala says the programs have given him more knowledge and self-confidence in different fields: finances, HR, sales, marketing, to name a few. 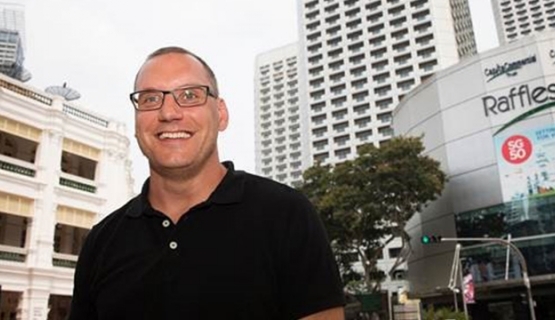 Rami Hakala, a participant in the Aalto EMBA program, is sitting along the cor­ridor of a congress hotel in Singapore. It’s Friday and the last day of the Aalto Executive Summit 2015, marking the end to a busy week of lec­tures and networking, countless cups of coffee, and a stream of conversations over lunch and dinner. The afternoon’s topic ”Circular Economy – The Future Shape of your Business and Social Land­scape” still lies ahead. The session is held by Mark Esposito and Terence Tse, a pair of intense and en­ergetic lecturers, who make sure they get the un­divided attention even of those sitting in the back row. The lectures take the form of a workshop, in­volving discussions, assignments, group work, and shouting out potential answers to the lecturers’ questions. Participants from Singapore, Iran, Taiwan, Fin­land, Algeria, and dozens of other countries discuss the topics and give their guesses, sharing experi­ences from their own countries. What will Rami Hakala take home from the Singapore Summit, as he returns to work? Hakala thinks it’s refreshing and eye-opening to think about topics and scenarios also beyond one’s own sector." Hakala thinks it’s refreshing and eye-opening to think about topics and scenarios also beyond one’s own sector. He manages a staff of 30 at his office in Vantaa. He has worked in the same industry for fifteen years, of which the last six for family-run company SKS. A few years later, Hakala began his studies on the EMBA program. What made him return? Many participants find it important for Aalto EMBA program to be international right down to its roots." Breaks during the Summit are a good time to get to know others – but also to take business calls back home. Telephone conferences take place in hotel rooms, while evenings are taken up by commenting on memos. Today, Hakala needs to delve into his company’s Polish business at the end of the day. How has the program’s workload been so far – is it too much for someone who works at the same time? Read more about AaltoJOKO® and Aalto EMBA programs. Aalto EMBA and AaltoJOKO participant. Managing Director, SKS Automation, Helsinki. Hakala works at SKS Automation, which is part of SKS Group, a 90-year-old family-run company with approximately 670 employees. SKS operates in Finland, China, Poland, Sweden, Russia, and Estonia. SKS Group provides product and service solutions for machine and equipment manufacturers.